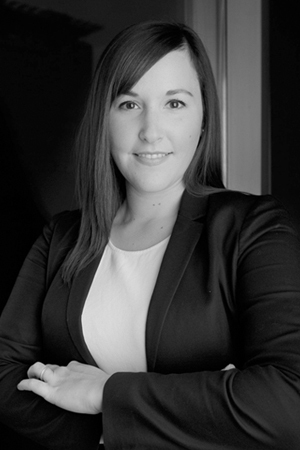 Jenna is experienced in all areas of family law and wills. She has a particular interest in matrimonial property division, child support issues and parenting disputes. Jenna has represented clients in both contested and uncontested matters. She has courtroom trial experience and has also assisted clients in alternative dispute resolution processes such as arbitration and mediation. Jenna also has experience negotiating and drafting agreements when parties have an amicable separation. Jenna has represented clients from various economic, social, and cultural backgrounds. She understands that each client is unique and is happy to provide a range of options to resolve issues. She enjoys helping her clients resolve their issues in a cost effective manner. Jenna graduated from the University of Alberta’s Faculty of Law in 2013 after completing her undergraduate studies at the University of Winnipeg. During law school she served as a volunteer with several organizations including the Law Students’ Association, the Aboriginal Law Students’ Association, the Recruitment Committee and Student Legal Services. Jenna joined Foster LLP in November 2014, after completing her articles in Edmonton where she gained experience in various different areas of law including Family, Criminal, Corporate and Wills & Estates. In her spare time Jenna enjoys golf, yoga and cooking.